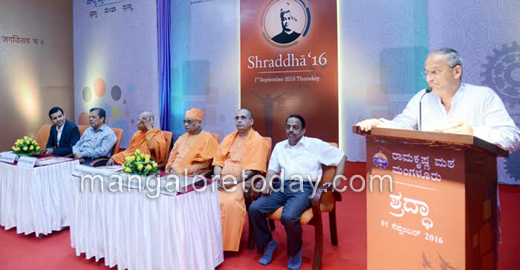 Mangaluru Sep 02, 2016: In his inaugural address at ’Shraddha’, an annual seminar for post-graduate students organised by Sri Ramakrishna Math, Mangaluru, at its Swami Vivekananda auditorium, Nitte University Chancellor Dr N Vinay Hegde on Sept 1, Thursday advised students to believe in self as told by Swami Viivekananda, rather than giving way to fear overtaking the ability to succeed in life. Chancellor Hegde wanted the students to understand the importance of life as it assumes significance than anything, especially in the wake of rising cases of students ending their lives much before results are out. To instil confidence among those students who cannot handle failure in academics, Chancellor Hegde cited the example of noted scientist Albert Einstein who was not even a post-graduate. Mincing no words, however, Hegde said, most of the students opt for post-graduate studies only for the sake of job, thanks to those educational institutions that have commercialised the field of education. Most of them are unworthy to be in the realm, he said. Higher study is a sacrosanct process for not just students, but also for the good of their family and nation. 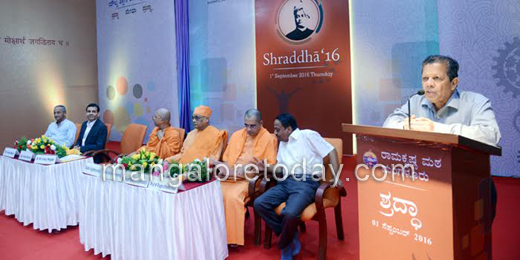 It is indeed a quest for knowledge, said Hegde dissuading those students for whom acquiring a degree is just a learning process. President of Sri Ramakrishna Math, Swami Jithakamanandaji exhorted students to derive benefits from the three-day programme that is only aimed at honing the skills of students towards achievement, concentration to excel and also developing the faith in self. While the first day was meant for post-graduate students, second day includes teaching faculty and third and final day for engineering students, Swami Jithakamanandaji said. MLC Captain (Retd) Ganesh Karnik said the seminar in its ninth edition is being organised to inculcate values in education. The inaugural session was followed by talks on ‘Self-development’ by Swami Nikhileshwaranandaji, head of Sri Ramakrishna Mission at Baroda, ‘Overcoming fear of failure’ by Swami Bodhamayanandaji, director of Sri Ramakrishna Institute of Human Excellence, Hyderabad, ‘Good sense is common sense’ by Prof K Raghothama Rao, director of Manas Centre for Training and Development, Bengaluru and ‘Personal power’ by Dr Vivek Modi, a corporate trainer.